Rugby League - Ovenden v Woolston Rovers in the Challenge Cup. Mark Sutcliffe for Ovenden. Ovenden are delighted to have gained a second successive home draw in the Coral Challenge Cup. 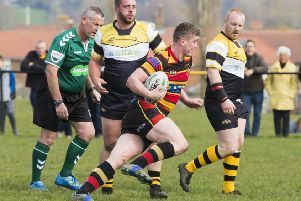 The Four Fields side will be at home to Bradford outfit West Bowling while fellow Halifax side Siddal face another away trip, this time to Millom. Pennine League champions Ovenden overcame Woolston Rovers 22-20 on Saturday while Conference top flight outfit Siddal were 24-0 victors away to Clock Face Miners in St Helens, scoring all their points in the first half. West Bowling beat Hammersmith Hill Hoists 42-12 while Millom attracted national press coverage with a 38-10 win over Red Star Belgrade. Ovenden’s Steve Taylor said: “It is fantastic to be at home and it is another derby as well. Tonight’s draw took place at Wigan St Patricks ARLFC and was conducted by three-time Challenge Cup winner and Leigh Centurions captain Micky Higham and Wigan Warriors stand-off George Williams. The winners of the 13 ties, which take place on the weekend of February 9/10, may hope to draw professional opposition from League One in the third round. SECOND ROUND DRAW: Underbank Rangers v Featherstone Lions, Wigan St Patrick’s v Great Britain Police, Thornhill Trojans v Rochdale Mayfield, Thatto Heath Crusaders v Leigh Miners Rangers, Ovenden v West Bowling, Normanton Knights v Haydock, West Hull v Bentley, Milford Marlins v Lock Lane, Wath Brow Hornets v York Acorn, Drighlington v Wigan St Jude’s, Millom v Siddal, Distington v Royal Air Force, East Leeds v Dewsbury Moor.